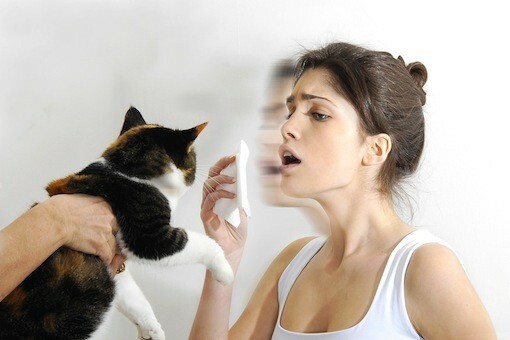 A CAT ALLERGY MAY CAUSE RESPIRATORY PROBLEMS AND ASTHMA ATTACKS TO CERTAIN PEOPLE. FOR YEARS MANY CAT LOVING CHILDREN AND ADULTS WERE UNABLE TO LIVE WITH THEIR ORDINARY CAT FRIEND. A lot of people don’t always consider the real risks of the allergies arising from felines. An infant or adult could become very sensitive to pets and an allergic problem with cats is something to be taken seriously. Though, in the 1950’s and 1960’s two cat breeds were found to be best suited for people afflicted with cat allergies. They are the Rex Cornish and the Sphinx. It is important to know that cat fur is comprised of several hair layers, often times the cause of allergy. The bottom layer is the duvet. It is short, soft and fine. Closest to the skin, it keeps the cat warm and maintains his body temperature. The second layer or median one between the duvet and the top layer serves as insulating material. The third layer, the superior one is a long thick hair layer protecting under layers, keeping them dry and warm. Another special type of cat hair are what I would call the “sensorial hair”. Long and stiff. It is for the most part concentrated on the cheddks, chin and front paws. Used mainly for their sense of touch. What is crucial with both The Rex Cornish and the Sphinx is that they do not have this long top hair layer most susceptible to trigger a cat allergy. While many persons have happily realised they had no problems with those cat breeds, this does not mean that all allergy sufferer will be symptom free in their presence. coat is its most distinctive characteristic. He is often referred to as “poodle cat”. He is active, people-loving, and a very intelligent cat and ….. cat allergy free. With his bizarre appearance, the Sphinx looks like he is almost naked. Only a short soft duvet, which will concentrate on extremities as he gets older, covers its body. The Sphinx`s face looks like it is covered with velours or suede. Many consider the Sphinx to be the ugliest cat. Showing every pleat and muscle while in movement is not necessarily the prettiest sight. He loves to be the centre of attention. His loving character and the low risk of cat allergy has conquered many hearts who oversee his ugly duckling image. Obviously not suited to harsh climate, the Sphinx will be kept in a warm environment. This Toronto native cannot be outside in the Canadian winters unprotected. Other than that, the Sphinx is a strong cat with very little health problems. It is common belief that because the cat has less hair on his body he does not shed. This is wrong. All animals renew their fur. And people suffering from cat allergy due to dander (dead skin cells) and cat saliva will find no comfort in living with with either the Rex Cornish or the Sphinx.